The Parks & Conservation Resources maintains 20,000 acres of parks which include the county's most beautiful examples of pristine Florida landscapes. Located throughout the county, each county-owned park is unique. From world-famous beaches, tranquil lakes, lush emerald green expanses of native habitat, to learning centers, playgrounds and dog parks. The parks provide visitors immeasurable opportunities for relaxation and recreation! 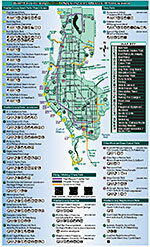 Following is a list of amenities available at various Pinellas County Parks. Click any amenity to see a listing of parks and where it is available. Those links will offer further information on the park, including a location map and diagram depicting the park layout and feature locations. All County parks provide parking, restroom facilities, and drinking fountains. Parks are open daily from 7:00 A.M. - sunset. Small Boat Ramps - No permit needed - Small ramp for boats without gas motors.